Juicy Italian sausage spooned into jalapeño peppers is an easy appetizer to make for for brave souls or spice-lovers – or substitute miniature sweet peppers if the spicy, kick-in-your-mouth experience isn’t really your style. If you used to like mozzarella cheese with jalapeño peppers, this is a nice replacement that recreates the spirit of the original (something savory and fatty inside the spicy pepper) without getting hung up on an exact imitation. The egg and almond flour here help hold the filling together, so it doesn’t end up spilling out of the pepper halfway into a bite. After all, you want it in your mouth, not on your shirt. 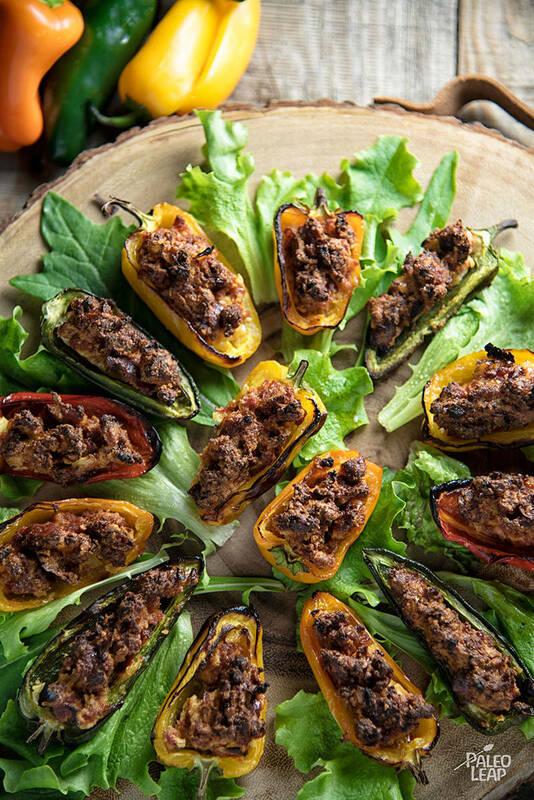 The obvious use for any bite-sized food is an appetizer, but these could actually work as a main protein if you used sweet peppers and gave everyone a few of them. Maybe try them with some roasted red pepper pasta, arranged in a circle around the pasta on the plate for effect, and let the vegetables take center stage on the plate for a change. SERVES: 4 PREP: 20 min. COOK: 25 min. Melt some cooking fat in a skillet over medium heat. Brown the sausage meat for 4 to 5 minutes and let cool. In a bowl, combine the browned sausage meat, onion, almond flour, beaten egg, oregano, and season with salt and pepper to taste. Stir until well combined. Spoon about 1 tablespoon sausage mixture into each jalapeño or sweet pepper half. Place on a baking sheet and bake in the preheated oven for 15 to 20 minutes.